If you picture the Rhine, the great European river that flows from the Alps to the North Sea, you might picture a river with regular, beautiful castles …. and you would be right. During the Middle Ages, the Rhine was a great European trading route, protected by the Holy Roman Emperor. Merchant ships, plying their trade, paid a toll and their passage was assured, their way safe. But after the Empire started to weaken, over the thirteenth century, this changed. 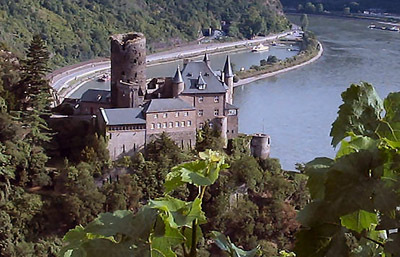 German barons – the original robber barons – built castles along the Rhine, and started to levy their own, illegal tolls – sometimes stretching iron chains across the river from the castle bank. The castles represented a business, selling rights of passage. Whereas at Mainz, the Rhine is half a kilometre wide, from Bingen onwards, it curves narrowly, making tolls relatively easy. Today, those ruined castles are perfect for tourism, but strung along the river, close enough often to walk easily from one to the other, they served to kill trade. Not only did the barons levy tolls, but they would steal ships and one, the Baron of Reitberg, in 1254, kidnapped the Queen of Holland from her ship. The kidnapping led to the formation of the Rheinischer Bund, the Rhine League – a co-operative venture with cities, princes and knights as members. They freed the Queen, deposed four of the robber barons and closed ten or more toll castles. It was only after Waterloo in 1815, that the great European powers finally collaborated to remove the offending toll collectors – just decades indeed before railways emerged as an alternative for traders. The Rhine had long been the greatest trade course in Western Europe, but its contribution to the common good had been shackled and hampered by the lack of consistent co-operation. Fast forward two centuries, and alongside the anniversary reminders of Waterloo, recent economic debate in the UK on productivity and the long-run impact of austerity reflects some of the fate of the Rhine, with the risk that in the move to a new settlement after the emergency actions in the follow up to the Credit Crunch, private competition will win out over common good – a win/lose or if we are unlucky in terms of global competitiveness, a lose/lose economic fate. The search is on therefore for a new approach for economic success, that balances co-operation and competition. I have been writing on this, linked to the new book I have co-authored and edited, Co-operative Advantage, in a series of blog posts for sister sites, including the New Statesman (including the text above), New Economics Foundation, Huffington Post, NESTA and the Young Foundation. My thanks to them for hosting the debate. Too much competition or too little co-operation? We call them global business leaders now, but will the new robber barons among them please stand up?